^ Moore, Walter J. Schrödinger, life and thought. Cambridge University Press. 29 May 1992: 10– [7 November 2011]. ISBN 978-0-521-43767-7. ^ The Dreams That Stuff Is Made Of: The Most Astounding Papers of Quantum Physics—and How They Shook the Scientific World, Stephen Hawking, (editor), the papers by Schrodinger. ^ A Quantum Sampler. The New York Times. 26 December 2005. 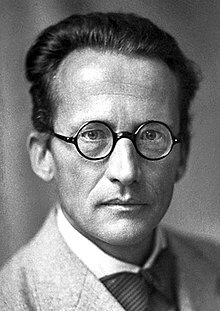 ^ Schrödinger: Life and Thought by Walter John Moore, Cambridge University Press 1992 ISBN 978-0-521-43767-7, discusses Schrödinger's unconventional relationships, including his affair with Hildegunde March, in chapters seven and eight, "Berlin" and "Exile in Oxford". ^ Moore, Walter J. Schrödinger by Walter J. Moore: Christmas at Arosa. Books.google.co.uk. 9 January 1926 [13 March 2010]. ISBN 978-0-521-43767-7. ^ Walter J. Moore. Schrödinger: Life and Thought. Cambridge University Press. 1992: 482. ISBN 9780521437677. 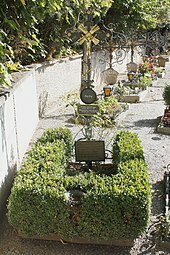 There was some problem about burial in the churchyard since Erwin was not a Catholic, but the priest relented when informed that he was a member in good standing of the Papal Academy, and a plot was made available at the edge of the Friedhof. （意大利文） Critical interdisciplinary review of Schrödinger's "What Is life?"